Fried Noodles are literally noodles that are fried crisp then topped with a chopsuey-like thick sauce. 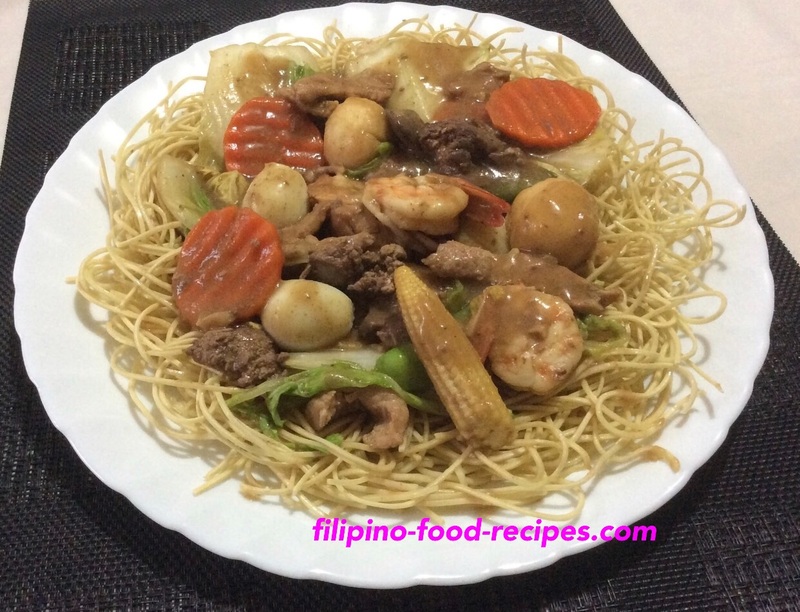 I’m a big fan of Pancit Canton, I especially love it when there is a thick sauce with lots of meat and vegetables. That's my definition of comfort food. Then I tried frying the noodles and topping it with the thick, flavorful sauce, it's ten times better. 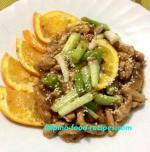 The meat and vegetable sauce is like that of Chopsuey, though a little thicker. Also, it doesn't have to be dried noodles that have to be soaked, yellow fresh noodles can work just as good, though will need more oil to make it crispy. You certainly want to eat this as soon as you top the sauce on top of the crispy noodles. The noodles will get soggy and will lose the distinct texture if soaked for more than a few minutes. So I suggest serving separately until everyone at the table is ready to eat. 1 pack	Canton Noodles 200 gms. 1 In a pan, put ½ cup of water. 2 Add the dried noodles to soften and let the noodles absorb all the liquid. 3 Turn the heat on, then add oil in the pan to fry the noodles. Set aside. 4 On a separate pan, saute the onion, garlic and ginger. Add the pork and let it cook for 3 minutes. 5 Add the vegetables except for the Chinese cabbage, together with the broth and oyster sauce and let it simmer until the vegetables are tender. 6 Add the shrimp, chicken liver and the squid balls and bring back to a boil. 7 Lastly, add the chinese cabbage and the quail eggs. 8 Thicken the sauce with the slurry. 9 Arrange the fried noodles in a platter then top it with the mixed meat and vegetables.